Today, I have another special issue of the Rich Life Roadmap. My colleague (and university classmate!) Mike Burnick is sharing his second contribution to tell you about a big opportunity I can guarantee you don’t know about. Using his knowledge and his idea, you may be able to set yourself up financially for life. Today, showing you the consequences of irrational trade policies and how you can protect yourself from it. I have a better read for you. Pick up a copy of Sun Tzu’s, The Art of War instead! 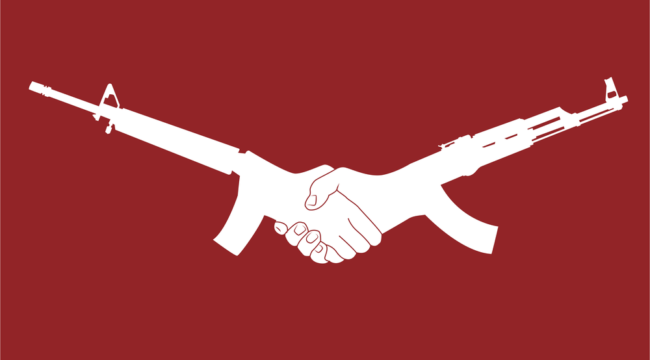 The Trump administration has taken a bellicose, saber rattling approach to its trade dealings since day one, with different officials often contradicting each other and the President. That sows the seeds of uncertainty, and one thing financial markets hate is uncertainty. Also, Washington seems to relish the idea of bullying the Chinese in public, rather than negotiating in private. That’s certainly Trump’s style, no doubt, but it’s also a risky strategy. China doesn’t like to be chastised publicly any more than anyone else, but culturally, saving-face may be more important to the Chinese. At the end of the day, the U.S. has more to lose from an all-out trade war than most of our trade partners, including China and the European Union (EU). 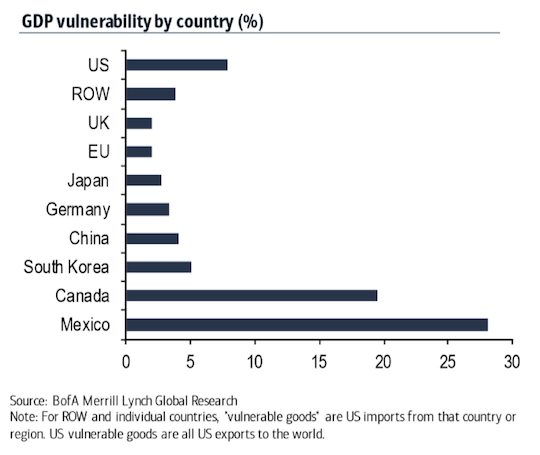 According to analysis by Merrill Lynch economists, roughly 8% of the entire U.S. economy is vulnerable to a trade war, as you can see in the chart above. Meanwhile, only 4% of China’s GDP is at risk. Europe has even less exposure to deeper trade sanctions. The longer this noisy posturing goes on, the more it weighs on both investor and business confidence. Ultimately, an economic slowdown could become a self-fulfilling prophecy. That is, the more uncertainty created by this confusing trade spat, the more likely investors will be to raise cash, go on summer vacation and wait things out. Also businesses will more than likely hold off on capital investments until the dust settles. Unfortunately, policy makers in both Washington and Beijing don’t seem to care. An all-out trade war is here and has financial markets on edge around the globe. Stock prices are choppy in the U.S., Europe and Asia. However, no stock market has gotten hurt more than Trump’s favorite trade target, China. 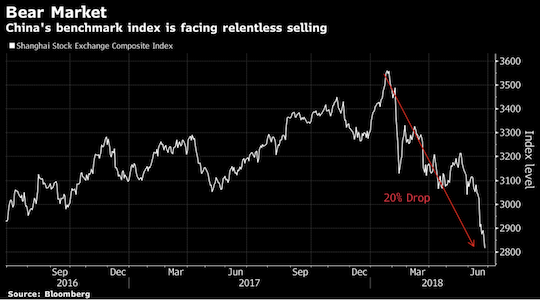 China’s Shanghai Composite Index of mainland stocks extended its decline this week to a loss of more than 20% since the January high, as you can see in the chart below. For most market watchers, that’s the definition of a bear market. And it’s China’s second bear market in less than four years! Nearly $2 trillion of China’s stock market value has gone up in smoke since the first of this year. It’s the heaviest financial toll claimed by escalating trade tensions between U.S., China and our other key trading partners. Now, other global markets are looking increasingly vulnerable. Market volatility globally has coincided with a rapid devaluation in China’s currency in recent weeks. The yuan tumbled 3% over the past two weeks. The biggest drop in China’s currency since Beijing deliberately devalued the yuan in August 2015. That sparked a 26% sell-off in Chinese stocks. Some believe Beijing could be at it again. Another directed devaluation of the yuan to make Chinese exports cheaper to foreign customers. Most U.S. investors don’t fret much about the loss of a couple trillion dollars in China’s stock market value. After all, there aren’t many American investors with significant holdings in Chinese stocks. However, there’s a contagion risk. A free-fall in China’s stock market, and other emerging markets, could trigger the same in U.S. stocks, just as it did in 1998 and more recently in 2015. In the aftermath of China’s unexpected currency devaluation in August 2015, the S&P 500 Index also tumbled about 12% in two months. After a brief rally, the blue chip index stumbled another 13% in early 2016! Bottom line: Keep a watchful eye on the yuan, as well as emerging stock markets. If this market continues to fall, it could quickly carryover to U.S. stocks. At the helm of Infinite Income is 25-year investing expert, Mike Burnick. Mike was a Registered Investment Adviser and portfolio manager. He’s helped Americans just like you build income for a better future for years. There’s nothing in the world of income he hasn’t seen before. Formerly Director of Research and Client Communications at Weiss Capital Management, Mike assisted managing the day-to-day asset-allocation and trading responsibilities for a $5 million ETF strategy. He’s a frequent guest commentator on CNBC, Fox Business News, Bloomberg TV and nationally syndicated financial talk radio programs. There’s no better leader to show you alternate methods you can use to secure steady and consistent streams of income — for life.